Cultural references are usually homages or parodies to famous franchises, such as Star Wars, in a place where they don’t actually belong. 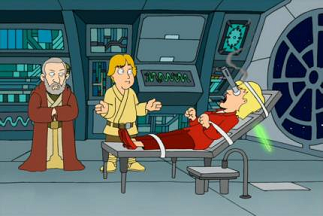 When we look at Family Guy for instance, a big part of that show is built around this concept; they have even ‘remade’ the original Star Wars trilogy using their own characters. There are a lot of references all over the place, too many to experience in a short time. But what I really wanted to talk about, is a statement that came out of BioWare a couple of months ago, where they said that they did not want to include any obvious references to other popular things in the game as it would break immersion; they wanted to keep the Star Wars Star Wars. Here I have to draw the comparison to World of Warcraft. Did they overdo it? In Azeroth, you can find the A-Team consisting of Gnomes, you need to collect power converters near Toshley’s Station for which you get a technological construct of terror, and there are even references to itself when it comes down to the return of certain bosses in new places where you have to defeat them for the second time. For people that do not get certain references, the universe of Warcraft is cartoony enough for those references to get lost in translation; you won’t even know there is something that links to the real world when you encounter it, it might as well be a part of the universe you are currently visiting. Mr. Muzyka, tear down that fourth wall! Finding cultural references in Star Wars The Old Republic is harder, but they are still there. 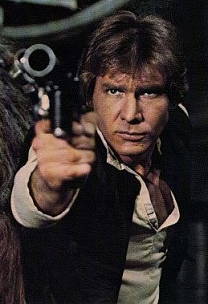 There are some inside Star Wars references, when I landed on Corellia for instance: Han Solo is from Corellia, and one of the better lines in A New Hope he gives, after Luke shoots a TIE Fighter, is “Don’t get cocky, kid.” One of the first missions I got, during the voice over, one of the mission givers mentioned to me that I should not get cocky while doing this mission. It made me smile. Most of the references, if they are there at all, can be found in mission names. Most of them are clever plays on words and sayings, such as A Rancor in a Pottery Shop or Revenge Served Cold. A direct link to a movie, at least as far as I am concerned it is one, would be the mission The Guns of Traken-4, linking it to The Guns of Navarone. Even some of the dialogue falls back to the movie, by stating “if they get the gun emplacements functional, they could take out the Markaran Outpost in one shot!” which mirrors the capabilities of the gun emplacements on Navarone which could take out ships with just one shot. So if you look, you can find something. If you ask me, there could not be enough references in a game such as this, as long as they are not the in-your-face style of WoW, but that has to do with the difference in game also. But you could argue this: is including cultural references a way of homage and honoring, or is it a clever way of avoiding creative burnout by reusing things others have created before. I personally say a bit of both with more weight on the homage thing. Good column, Thom. I’ll be watching for the references, as I level. First, I’m pretty sure that Lucas Arts spelled it out for Bio, no cultural references period. George seems fit to be tied when deciding who will shoot first and the fans be damned thinking otherwise. Hopefully, as the game progresses the cuffs will be taken off. But the guys/gals on the front lines creating the game, these people are action / sci-fi / fantasy dorks like the rest of us. The LOVE the cultural references and I can see them chomping at the bit to add them in. Lastly, regarding the immersion bit. I understand Bio’s (or George’s) point-of-view on keeping the game as immersive as possible. After all, they’ve been touting “story driven MMO” for literally years now. 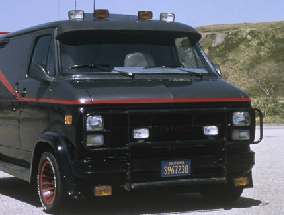 It would seriously remove a lot of the blood, sweat, and tears that these writers have poured into the game if the A-team (all Bountry Hunters of course) suddenly swoops in to save the day. With the above said, I think it’s simply too early to be asking or even wanting said cultural references. WoW’s references to pop culture really didn’t begin taking off until BC, then they kinda went crazy (really Blizz? Lady Ga Ga?!?!). There’s a reference to The Lord of the Rings on Dromund Kaas that I love. When you’re going through the Dark Temple approach there’s one of those “hills” that the path splits around, and on top of it there are a few large rectangular crates. One one of those crates is a datapad that talks about a group’s last stand there and that “they are coming” (or something to that effect). This screams of Balin’s Tomb, with the large rectangular crate being the tomb and the datapad being his journal. I believe there were discarded weapons scattered about as well but I’m not sure of that. These don’t break the immersion for me as long as they’re not too common. Maybe it would bother me more if I was an RP’er but I’m not. While I see a few of your points, I think you overestimate how much Bioware wants to put in references. If you’ve played Dragon Age or Mass Effect, you probably haven’t noticed many or any pop culture references. Agreed that we should just enjoy the game =D. 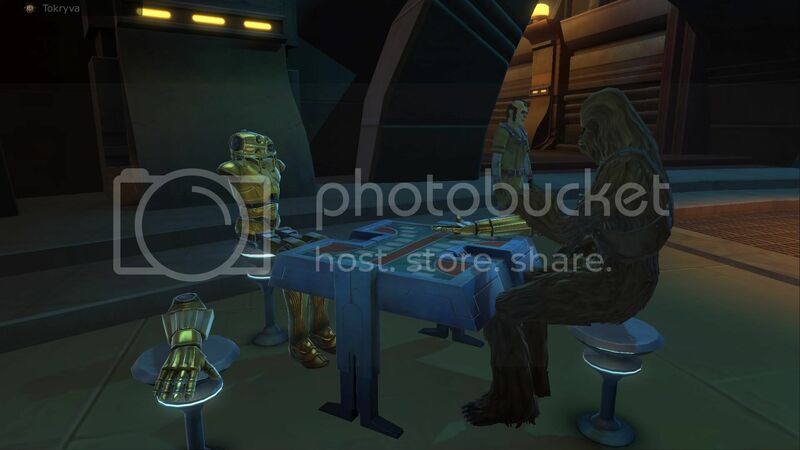 I think the small references they have now in SWTOR are fine. They seem to only be references Star Wars itself from time to time, and I don’t have much of a problem with that. Usually it isn’t direct, anyway. One thing I did notice was a few slight inspirations from other Sci Fi on Hoth. When the first two places you go to on the planet are “Adamas Spaceport” and “Dorn Base,” I can’t help thinking of Adama from Battlestar Galactica and Michael Dorn, who played Worf in Star Trek (and voiced a character in Mass Effect 2). Though those might just be my imagination, since I’m a big fan of both those shows. Perhaps Bio does have a hands-off approach when it comes to cheese (pop-culture) references which we all love; however, my opinion is based on having met several Game Designer’s of a recently king of MMO’s Company. I’ve also have friends who are doing CS and Q/A work with a certain space-themed MMO and People Simulation game and have met some designers while out having drinks and such. The impetus is there, but (again, my opinion) there are some “down from upon high” mandates that are clapping the irons on pop references. In the video just posted in Holonet Links #27 the Atreyu – Falling Down at 2:23 is the Tardis from Dr Who.